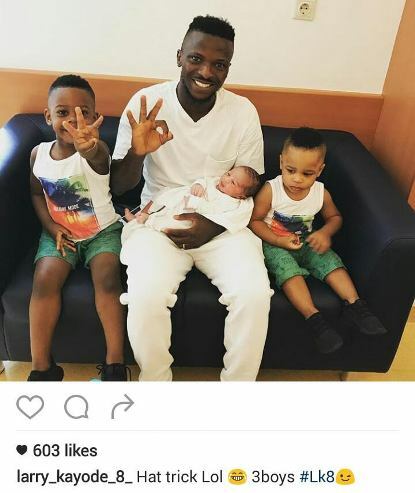 If you like to use football terminology, I would say Nigerian Footballer, Kayode Olanrewaju has a hat-trick of children. One may argue that he didn't have them once but nonetheless, he played a match before they were conceived. The play maker in simple terms has welcomed his third child with his wife. He shared the photo of his child, Jamin and captioned the picture: Hat Trick, Lol 3 boys. Tobi Olarenwaju "Larry" Ayobami Kayode (born 8 May 1993 in Ibadan) is a Nigerian football footballer currently playing for FK Austria Wien.